Men who love a ring that stands out in a crowd will enjoy the striking appearance of this black tungsten ring. 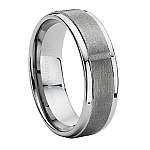 Polished black tungsten is wrapped with a natural silver-toned tungsten band for a unique looking wedding band or fashion ring. This contemporary 9 mm design is certain to get noticed, and because it is made from tungsten-carbide, it will be virtually indestructible. Inside, the edges of the band are rounded and smooth for a comfortable fit. Comfort-fit rings should be ordered 1/2 size smaller! Had a great experience using the site. Ordering was quick and easy, the ring shipped the next day and arrived in about a week. It is exactly as described! I would highly recommend ordering from here. This is a swell ring. It has a solid feel to it, and is very flashy. I really appreciate the larger sizes that MWR carries. The ring was shipped quickly, and as ordered. 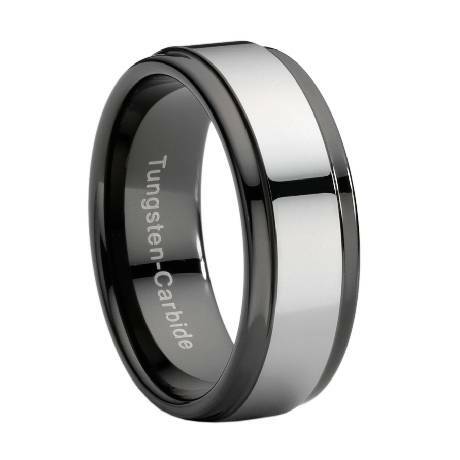 Tungsten-Carbide Wedding band is AWESOME. I am very pleased with the ring that I purchased. The ring is exactly as advertised in quality and appearance. The service was excellent and prompt. Would MOST DEFINATELY recommend and would use again ! This is THE ONLY place for a large size ring. Literally, I looked all over!! The customer service was excellent during the purchasing process. They emailed me promptly with my questions and when I originally received the ring, it was too large, and the return was simple and a quick turn around. The ring itself its great looking in person and is great quality. 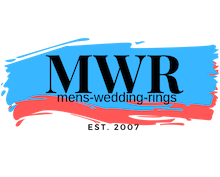 Thanks Mens-Wedding-Rings! Will be wearing this for the rest of my life and I'm glad I used this site. This ring was a replacement ring for my husband who is very hard on jewelry. The durability, design and price were the selling factors for this ring. I ordered the wrong size and had a replacement ring within a week. Excellent customer service and communication.